The PokerStars EPT was expecting a record-setting turnout for the 2011 EPT PokerStars London Main Event, but hopes were quickly dashed when Day 1a of the tournament attracted a less than overwhelming 280 entrants –in 2010 Day 1a attendance was 339. On Day 1b the tournament would need to have a huge turnout to surpass the 2010 attendance record of 848 players. Unfortunately, attendance was once again lackluster on Day 1b as 411 players registered on the second starting day of the tournament. The overall attendance was 691 players, generating a £3,351,350 prize-pool that will see £750,000 ($1,167,000 US) go to the winner of the tournament –a total of 104 players will make the money. 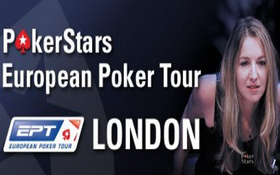 The EPT London is easily one of the top 10 most prestigious poker tournaments in the world today. Last year’s tournament saw David Vamplew walk away with a massive £900,000 payday, and even though the 2011 version of the EPT London Main Event did not surpass the £1,000,000 first=place prize tournament officials were hoping for, it did surpass the $1 million mark. Of the 411 original entrants, 251 players survived the day, and will join the 175 players who lasted through Day 1’s action. On Day 1b it was poker pro Benny Spindler who jumped out to an early lead, and ended the day as the Day 1b chip-leader with 160,800 chips. Among the notable names who survived Day 1b were Sorel Mizzi, Justin Bonomo, Jeff Sarwer, Matthias de Muelder, Andrew Feldman, Allyn Jaffrey Shulman, Ivan Demidov, David Williams, Toby Lewis, Fabrice Soulier, Sam Stein, Tristan Wade, Dan Kelly, Victoria Coren, Ike Haxton, Brian Hastings, Marvin Rettemeier, Boris Becker, Humberto Brenes, Joe Cada, Jason Mercier, Vanessa Rousso, Eugene Katchalov, Scott Seiver, and Joe Hachem. Among the players who were not able to make it to Day 2 of the tournament included Team PoekrStars pros Daniel Negreanu, Bertrand Grospellier, Viktor Blom, Jonathan Duhamel, and Liv Boeree. Other notable names eliminated on Day 1b were November Niner Matt Giannetti, Jean-Robert Bellande, Daniel Cates, Matt Waxman, and recent WPT Legends of Poker winner Will Failla. This entry was posted on Sunday, October 2nd, 2011 at 9:27 am and is filed under Poker News. You can follow any responses to this entry through the RSS 2.0 feed. You can leave a response, or trackback from your own site.